Could you hit a silhouette target at 400 yards, shooting offhand? Probably, with a little practice. Now try doing that three times in just 4.37 seconds, including picking up/mounting the rifle! Not possible? Watch the legendary Jerry Miculek do that in this impressive demonstration of rapid-fire rifle shooting. Jerry Miculek — that name is synonymous with revolvers. But Jerry is also one heck of a rifleman, as he demonstrates in this video. Grabbing his rifle from the top of an oil drum, Miculek proceeds to put shots on three different steel targets at 400 yards — all in under 4.4 seconds. Most of us would be lucky to make one successful shot in that time limit. 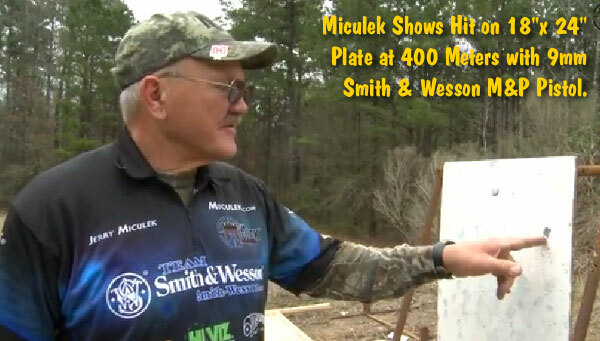 Miculek hits all 3 targets (and makes it look easy). In this video, Jerry hits not one but THREE c-zone targets at 400 yards. And — get this — he does this in under 4.4 seconds starting with his rifle laying on a support (plywood on top of a barrel). It took Jerry two tries (on his first run he hit 2 out of 3 in 4.65 seconds). On the second attempt (see video starting at 2:19), it takes Jerry just 4.37 seconds to shoulder his rifle, aim, and fire three shots, each hitting a separate steel target. Wow. That’s truly remarkable. Most of us would need ten seconds (or more) just to get the scope on the first target. 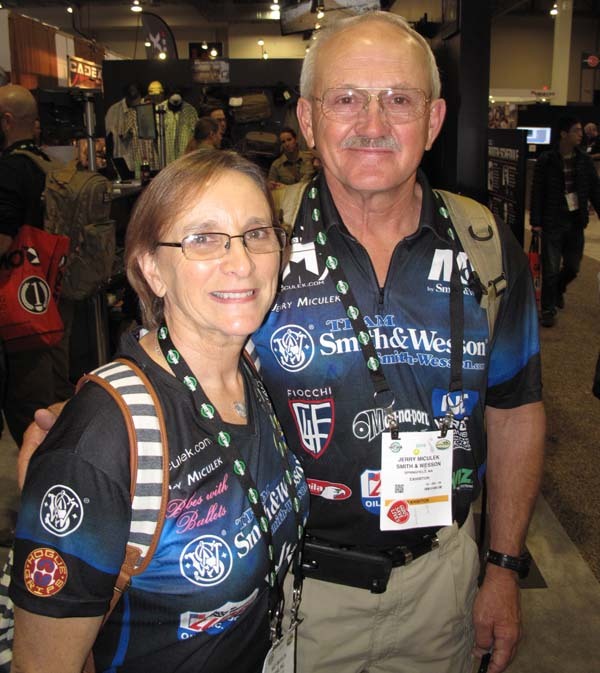 Share the post "Miculek Hits Three 400-Yard Targets in 4.37 Seconds"
We had a chance to meet with Jerry Miculek and his wife Kay at SHOT Show. These are very nice people who also happen to be superb shooters. They are great ambassadors for the shooting sports. We talked about Jerry’s many titles and match wins over recent decades. He explained: “It didn’t come easy… the winning comes after years of hard work”. Jerry’s name is synonymous with revolvers. But Jerry is also one heck of a rifleman, as he demonstrates in this video. Share the post "Mr. and Mrs. Miculek — a Talented Twosome"